Chicken with 40 cloves of garlic! it’s an Ina Garten recipe! it’s so yumtastic. A chef once told me that if you break apart the bulb – i.e., separate all the cloves – it will stay fresh much longer than if you keep the bulb intact. I find that it does stay fresher longer! My mom grinds together ginger and garlic and keeps a jarful of the paste in her fridge. She uses it to flavor Indian, Thai and Chinese dishes. Just throw equal quantities of both in a food process (a mini one works great) and the stuff lasts forever! Uses 10 cloves and oh so yummy! When we do eat steak, this is the only sauce I make with it! The sauce is also delicious on chicken, and I imagine good with grilled veggies too. I use three heads of garlic instead of the 2 called for in the recipe. Next time I make it I may freeze a portion of the sauce, as the garlic roasting takes an hour. It makes a wonderfully light, creamy sauce without using cream or butter. 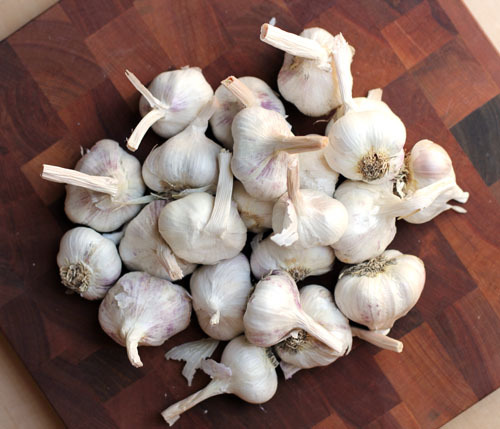 Jane, I just discovered from a friend…that her mom would peel the garlic (or buy the bag of peeled garlic from Costco) and put them all in a glass jar with a lid, then fill it up with vegetable oil, stick it in the fridge and Voila! You now have peeled garlic on-demand, as well as garlic oil for cooking. I was pretty excited about this, as I am often too lazy to peel garlic for a meal. Tip: make sure its vegetable oil and not olive oil…or it will solidify in the fridge :(. check out my wall at wwww.facebook.com\anniesgarlic for garlic recipes..most are links from other bloggers…and they range from simple pestos and garlic bread to stuffed flank steak and many great other main courses. I have also heard you can cut up fresh garlic (or leave it in the whole clove if that’s more your flavoring style but I like the minced action) and then distribute them into an IceCube Tray. Throw em in a hot pot and you’ve got garlic in a matter of ice-melting seconds. Keeps it fresh tasting and wonderful. Darn, I can’t find the recipe online, but there’s a great chicken-pasta salad made with 24 cloves of garlic…I’m pretty sure it’s an old Williams-Sonoma recipe. I know you brown the chicken in olive oil, then remove it from the pan, add the peeled garlic cloves, and brown them slowly until they’re super caramelized. Then add chicken stock and red wine vinegar, reduce, add chopped parsley and rosemary, and pour the whole thing over the chicken and penne pasta and serve room temp. I just can’t recall exact proportions of things right now! Agree with the ice cube tray idea, but in case you don’t have any, just toss them in the freezer. We had the weirdest, grossest infestation of bugs (yay student apartment living) in our pantry and couldn’t keep onions or garlic fresh to save our lives. Into the freezer they went (fridge for the onions though). Now I do it all the time! Make homemade pesto and freeze a bunch! GREAT ideas and tips everyone – LOVE it! Plant some and you’ll have your own fresh garlic next year! I can honestly say I’ve never even thought about planting garlic…that sound pretty cool, actually! Really?!?!?! Do you just plant the clove or the whole bulb? Can you do this with store bought garlic? I am SO doing this! I love all the ideas..Just harvest our garlic from our garden and we have a lot. My top tip? Just add garlic to everything. Roasted on pizza or with olives, in tomato sauce on pasta, heck, put it on your ice cream. I’m joking … kind of. And from one garlic groupie to another, I hope you’ve bought one of those metal soap thingumajigs which remove strong food odors from your hands – I was sceptical, but mine has honestly made being around me so much more pleasant for everyone! Last year I had quite the garlic harvest so I did some searching and I found something somewhere that said to peel the garlic- put them in canning jars, fill with olive oil and freeze. I am still working on the garlic in the freezer. I will do it again. It is kind of a pain cause the garlic is not that easy to remove, i.e. sharp knife searching for cloves in frozen olive oil, but the garlic was fantastic tasting and I just put the olive oil in the pan too. And frozen garlic was way easy to cut. I. LOVE. GARLIC. Seriously. I’m pretty sure it exudes from my pores. It goes in everything I make. When chicken goes on sale, I’ll cook olive oil & garlic on the stove, throw the chicken in the pan with salt and pepper and then freeze it so I’ll have some ready-made chicken breasts for a quick meal. I forgot I used to make the garlic infused oil! I’ll have to make some of that again! I have seven children and they all love garlic. I have been putting it in everything since they were young. If I leave it out of the typical salad dressing I serve, they say something is missing. I use 4-7 cloves just in my dressing. love that all your kids love it!